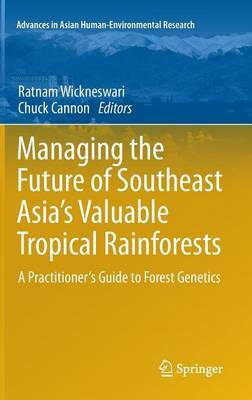 This book provides current knowledge about tropical rain forest genetics and its implications for the profitable and sustainable management of forest resources in Southeast Asia. Each chapter covers a major topic in the evolutionary biology of tropical rain forest trees and how management systems interact with these natural dynamics. Authors provide an up-to-date and insightful review of important scientific findings and conclude with practical recommendations for the modern forester in Southeast Asia. Several chapters provide compelling discus-sions about commonly neglected aspects of tropical forestry, including the impact of historical dynamics of climate change, anthropogenic threats to genetic viability, and the important role of wildlife in maintaining genetic diversity. These discussions will promote a deeper appreciation of not only the economic value of forests, but also their mystery and intangible values. The silvicultural industry in Southeast Asia is a major contributor to the regional economy but the connection between scientific research and the application and development of policy could be improved upon. This book will help bridge that gap. This book will prove beneficial reading for forestry students, professional forest managers, and policy makers, who do not have technical training in genetics. It is also intended for non-specialists who are involved in the tropical timber industry, from the local forest manager to the international timber purchasing agent.